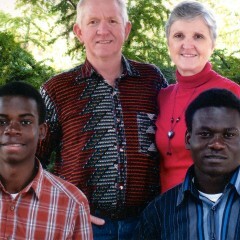 Lee and I met in the Congo in 1986 and felt the Lord leading us to spend the rest of our lives serving Him here. We both like the interior and the open spaces and slower life style of the bush people but God moved us to the Capital City in the late 90’s. Today we live in a city with 10-12,000,000 people. The association of Free Baptist Churches which we work under has 10 churches in Kinshasa. We attend and work with one called Petro Congo which is about 30 kilometers from the house we rent. We began working with this church when we moved to Kinshasa after our mission station was looted. It has been so encouraging the last couple years to see this church vote in a pastor and vote to pay him as well, who is a third generation Christian. He and his wife love the people and they love teaching them the Word. They have a family of three children and their children are involved in the church also. We are very encouraged with the commitment of Pastor Pango and his wife Emily. They have taken a stand on things that a lot of older members don’t what to, mainly the issues of traditions.